I came across this awesome poster the other day! 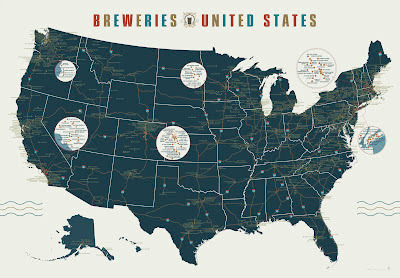 As many people have pointed out, there are a few errors and some breweries are missing, but that's to be expected with the rate of new breweries opening. It even enlightened me to a few breweries nearby that I was unaware of like Chocolate City. So what do you all think, is this the map for my next roadtrip? you haven't had anything from Chocolate City?!?! Man you're missing out! Yup! My problem is that I eat out rarely-to-never, especially in D.C. It looks like they only package in kegs? and don't distribute outside the city. I will look into venturing to a venue they have taps at! Hi, I married a Shegogue who is from southern maryland and she went to JMU. We now live in Frederick MD and I am an avid homebrewer and work at Flying Dog. I noticed you placed in the battle of the bubbles, Well Done! James - small world! I have been trying to find a free weekend with a friend to come tour Flying Dog. He has an abnormal schedule so we are still waiting to pick a date. Do you participate in any homebrew clubs? We should organize a beer swap sometime! Looks cool. I like this map. I think that is one of the most pleasant modern styles to draw that way. This is a very detailed map, but the fact that now very often such plants are opened are not all of the recent enterprises recorded here.